Journey from Alaska’s largest city, Anchorage to the port town of Seward via motorcoach. Once in Seward, board the Kenai Fjords National Park cruise and venture to a majestic tidewater glacier. Marvel as it calves. Feel its power and hear it roar! You’ll travel to the face of a tidewater glacier and witness one of the most active tidewater glaciers in the park as it thunders into the sea. Watch for humpback whales, orcas, seabirds, sea lions, otters and other wildlife. This trip is narrated by certified captains at the helm of the most modern fleet of vessels in the state. Enjoy lunch on board as you track your route on the flat-screen monitors displaying the map of this beautiful national park. At the end of the cruise, make the return journey back to Anchorage aboard the Alaska Railroad. Your tour ends in Anchorage at the Rail depot. This tour departs from the Westmark Anchorage Hotel with a taxi transfer to the Egan Center. Dress in warm layers. Bring your camera and binoculars. This cruise will spend some time in open waters. If you think you may be susceptible to motion sickness, we recommend taking motion sickness medication the night prior to alleviate discomfort so that you can enjoy your sailing. Wildlife sightings are likely but not guaranteed. Travel time is approximately 3 hours each way. 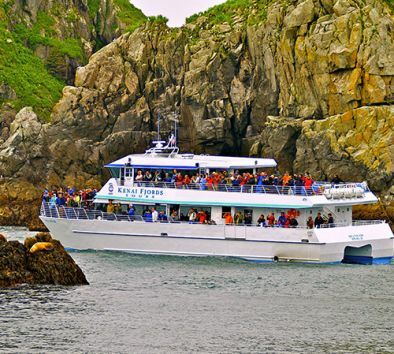 This tour can be booked in conjunction with a Gray Line Alaska package or on its own. To book this tour, please call 1-888-425-1737.